Autism, Asperger’s and “nerd” personality features (to use a concept from Temple Grandin, a prominent author and speaker on both autism and animal behavior) seem to have something of an air of mystery and intimidation for many mental health professionals. Let’s face it, clients with autism/Asperger’s have very different ways of perceiving and thinking than most counselors do. For instance, talking about feelings in an unstructured way à la Carl Rogers is unlikely to be nearly as productive with these types of clients as with other clients. Barring extreme examples, I prefer to think of individuals with autism, Asperger’s or nerd characteristics as having a set of co-occurring personality features rather than a mental disorder. To that end, I refer to these kinds of clients as PFAANs (personality features of autism, Asperger’s and nerds). I refer to non-PFAANs (sometimes called neurotypical) as NONs. When I became a licensed professional counselor, I had a decade of experience running pigs through mazes (animal behavior/animal welfare research) for my Master of Science and working as a humane handling consultant/reviewer in more than 350 slaughterhouses (basically, I did work similar to what Grandin does in slaughterhouses). During that time, I read all kinds of books by Grandin and others to see how autism might help me understand animal and human behavior and cognition to further my work and career. Coming from this background, I was rather surprised to learn that I was expert in counseling adults with PFAAN, and now a large part of my practice rotates around this. I provide a therapy group for developing social skills in adults with PFAAN, and I help NONs better understand and engage with spouses or loved ones with PFAAN. At least in my region, there are very few mental health colleagues I can refer to who have much expertise in adult PFAAN approaches and needs. To illustrate how many clients you might be seeing without realizing that they have PFAAN, consider whether you could apply the ways of thinking presented in this article to many of your clients who work in science, technology, engineering and math careers. You will see clients with PFAAN in your practice, so it is important to have a way of understanding their thinking patterns. A central issue for clients with PFAAN is their lack of ability to naturally recognize emotions and empathize with others. If you’re confused by how to help, it may be useful to conceptualize the different ways that emotions seem to work in these clients compared with most other clients. A common tool used in mental health therapy is the Feeling Wheel developed by Gloria Willcox. It is the one tool I have found that both PFAANs and NONs seem to comprehend, so it has served as a valuable tool in bridging the understanding gap between these two groups. The Feeling Wheel is an excellent way of visually conceptualizing how emotions work differently for clients with PFAAN and NONs. Grandin has suggested that a good method for teaching cognitive flexibility to individuals with PFAAN is to describe people and their actions as a mixture of colors. The Feeling Wheel (see above) is also in line with another of Grandin’s concepts in which she describes a difference between PFAANs and NONs. She says that many individuals with PFAAN tend to think in specific pictures, whereas NONs seem to think in words/emotions. How this pictures versus word concept works can be quite complicated, but the visual concepts in the Feeling Wheel simplify how to explain this difference. I have developed a list of concepts using the Feeling Wheel and its colors to help counselors and clients empathize with one another and to get to the clients’ goals and skill development. Concept A: People with PFAAN will intuitively get/understand only the innermost (core) feelings. If most people in the world had PFAAN, the Feeling Wheel would probably contain just an inner core (see image below). The recognition of the detailed emotions (represented in the outer rings of the Feeling Wheel above) seem to develop naturally in NONs but not in individuals with PFAAN. The outer rings of the Feeling Wheel can be taught to clients with PFAAN, but this must be done in an inductive way, similar to the way that most NONs learn math. NONs start with 1+1=2; people with PFAAN need to draw a picture of what the more subjective feeling looks like in NONs so that they can relate the outer rings back to the inner core that they more readily understand. I’ll share more about this later. Individuals with PFAAN tend to have only one or a few emotions at a time. They seem prone to black-and-white thinking, rigidity to change and litigiousness (for example, they may ask what the hard rules are for social interaction). So, when a person with PFAAN sees a cow, and if he or she finds cows peaceful, conceptually, the emotional experience he or she will likely have is the picture of that cow overlaid with the emotion (see below). The way that emotions work in people with PFAAN seems to more closely model the way that emotions work in social animals. For example, a dog either likes a person or is scared of a person, but the dog rarely seems to have both emotions at the same time. 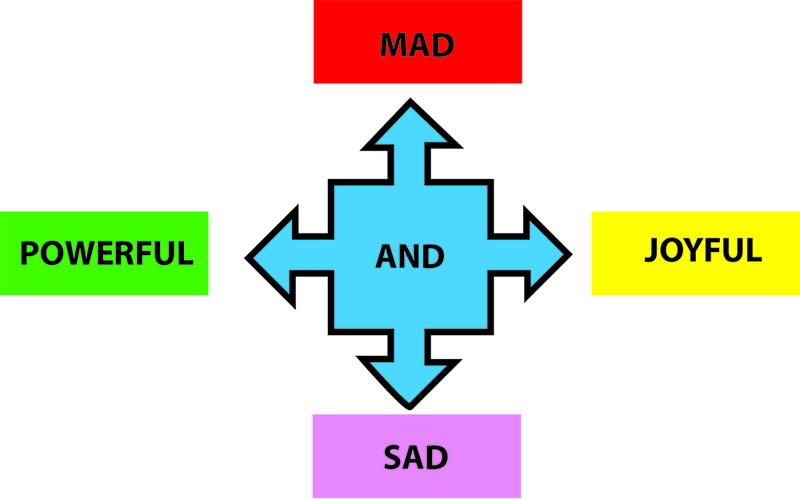 Concept C1: Individuals with PFAAN tend to have one emotion at a time (AND versus OR emotions). NONs can often experience several emotions together. I refer to this as AND emotions (see below). Clients with PFAAN may also have different emotions about something, but they can process only one at a time. 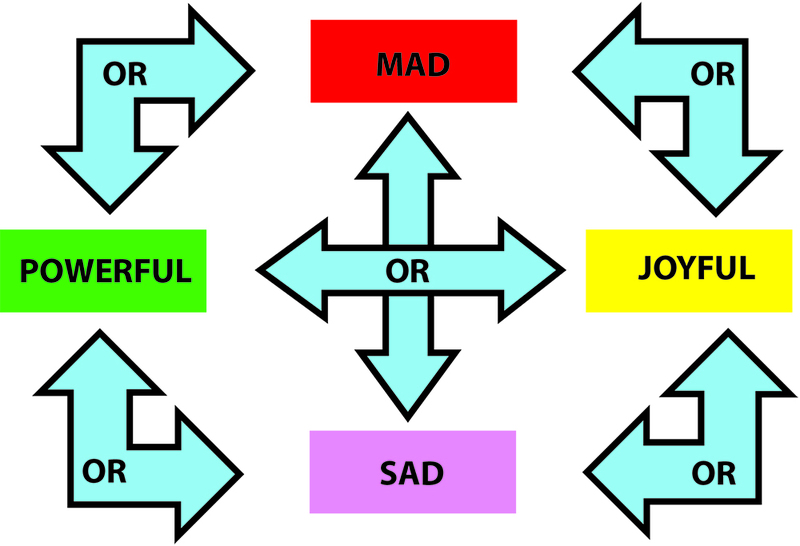 I refer to this as OR emotions (see below). Concept C2: NONs mix emotional colors to get completely novel feeling colors, whereas PFAANs flip between colors. Related to Concept C1, NONs use AND emotions to make new emotional colors (think of mixing paint). A NON might feel strongly peaceful yet a little afraid when seeing a cow (mix dark blue and light orange to get a teal emotional archetype cow). Individuals with PFAAN won’t readily mix colors, although they might flip between emotions rapidly. The flipping is where they are analyzing what to do (“Should I cry or run away?”) if more than one emotion is present (for example, strong peaceful feelings and a little fear of a specific cow). Usually, the emotion expressed in the client with PFAAN is the most “vivid” color emotion. Concept E: Individuals with PFAAN are prone to emotional and sensory overload, which may lead to a new emotional color that equals shutdown. What do you often get if you mix all the colors of the feelings together in individuals with PFAAN? Black. 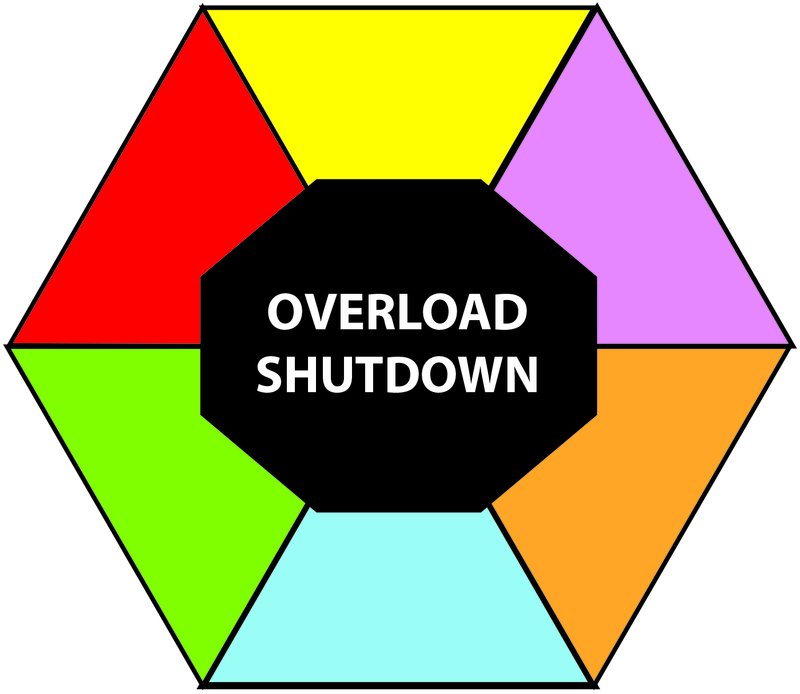 This is a good conceptualization of what happens in many people with PFAAN when they are confused or overloaded: shutdown. Shutdown also happens in NONs (think about the shutdown of emotional controls in the animated movie Inside Out, where everything became gray and the emotions no longer worked). However, it usually takes much more time and intensity (think posttraumatic stress disorder) for NONs to get to black. An example from my experience is that giving too many food choices to a client with PFAAN can lead to shutdown. A large menu may be too hard for these individuals to process in a given amount of time because what they “feel” like having can often take much more time to figure out than it would for other individuals. Concept F: The default emotion of most individuals with PFAAN is anxiety (if not shutdown). Anxiety appears to increase in those with PFAAN from adolescence on. I believe that increased anxiety proneness is a strong feature of being a person with PFAAN, although such a view is controversial. Novelty — good, bad or indifferent — almost always causes more fear in those with PFAAN than it does in NONs. Hence, rigidity in behavior, speech, routine or time management may often be an attempt to control fear. Individuals with PFAAN and animals share the experience of novelty and sensory overstimulation producing anxiety and fear. An example from livestock science is the observation of flight zones in animals. The flight zone is how far an animal stays away from a person or experience. The less anxiety the animal feels, the smaller the flight zone. Novelty and sensory overload in animals produce fear or anxiety and lead to avoidance behavior. Thus, if this is the animal’s experience, the flight zone increases. Flight zones are reduced through exposure and positive (or at least neutral) experience. Being around strangers often produces great anxiety in animals and in clients with PFAAN. Thus, both will often avoid strangers whenever possible. It is important to realize that counselors will likely need to be much more directive and teacherlike with clients who have PFAAN than with their other clients. Unconditional positive regard, reflection and talk therapy probably won’t be particularly useful because these clients are unlikely to get what these Rogerian-based interventions are working on or doing. What is most likely to be helpful to these clients is to remain focused on the skills that they need and then teaching them those skills. What follows are some approaches I have discovered that seem to help clients with PFAAN in the context of therapy. 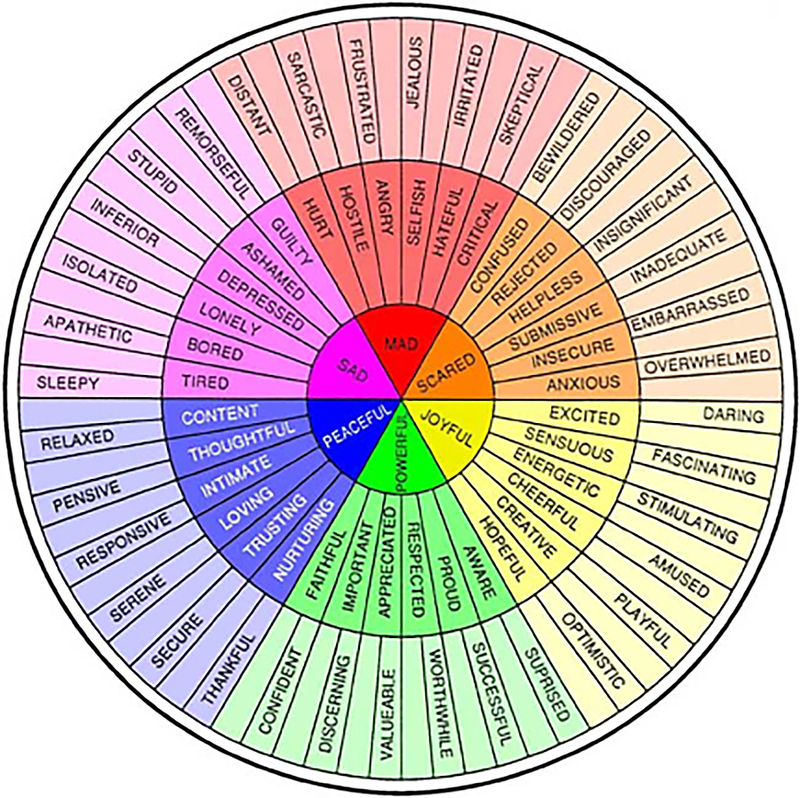 1) Teach/discuss the Feeling Wheel concepts. I have found that simply teaching the Feeling Wheel concepts discussed in this article provides many clients who have PFAAN with the tools to move toward their goals and something constructive to do in the counseling context. These clients tend to be analytical and often like testing ideas. Interestingly, many clients with PFAAN are shocked when they find out that most people experience more than one emotion at a time. PFAANs and NONs speak a very different emotional language, so it is important to have a “Rosetta stone” to help facilitate emotional communication. In my experience, the best emotional states in which to be empathic/thoughtful are sad, peaceful and powerful. Mad, scared and joyful appear to be more action oriented. Make sure that the client with PFAAN is in or near one of the thoughtful emotional states when practicing empathy training. 3a) Teach these clients to label the emotion they see in others so they can relate it back to the core emotions and choose an emotionally appropriate response. 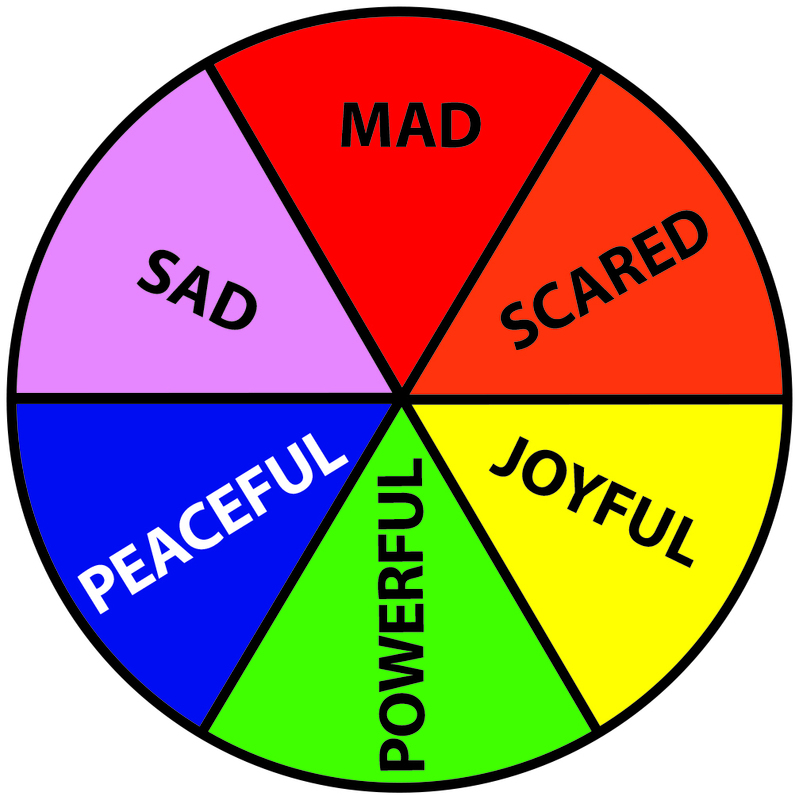 Practice what the emotions on the Feeling Wheel’s outer ring look like. For example, ask what the visual and auditory signs are of a person who is discouraged. The person may look down, exhibit less body movement, speak about being discouraged and so on. Once that emotion is labeled, trace it back to the core emotion (discouraged is a kind of “scared”) to help the client understand it better and have empathy. 3b) Teach clients with PFAAN phrases and actions that can be used once they empathize with the person’s emotion. Just because clients with PFAAN learn to empathize does not mean that they know how to respond appropriately. For example, a client with PFAAN might feel great anxiety at a funeral. To break the silence and sense of mourning that is causing his anxiety, he may start talking loudly to those around him about a new model airplane he is working on. This incorrect social response can have serious repercussions. 4) Teach one concept from the Feeling Wheel at a time. Remember, the emotional parts of the Feeling Wheel should be taught to clients with PFAAN in much the same way that you would teach children math: Start with the basics and work up. Clients may have no idea what scared looks like in themselves or others, so provide clear, visual, colored examples to illustrate the emotion. For instance, if the emotion is isolation, you might provide the visual of a person trapped in a purple box (because purple is the color for sad on the Feeling Wheel). A mirror might also be useful to show these clients what their facial expressions seem to be communicating to the counselor at any given time. 5) Teach clients to say “whoa.” Emotional processing takes longer in people with PFAAN, so it becomes very important for these clients to be able to communicate this to others. This is especially important in intimate relationships. I have noticed that many individuals with PFAAN are married to or have intimate relationships with NONs who are very emotional. To adapt a Catholic marriage concept, I think there might be great complementary benefit to such matches. He (usually) balances out her (usually) emotionality, whereas she provides him with an emotional vocabulary and a feeling of being needed. Sometimes this arrangement works well for many years, but then the more emotional partner begins to believe that the emotional avoidance and lack of emotionality/spontaneity on the other partner’s part indicate that he no longer loves her. Very often, this is not the case. To offer a case example, if a wife asks a husband how he feels about her, she usually wants an answer that is specific and immediate. If the husband has PFAAN, it may take him some time to work out exactly what feelings he needs to communicate, no matter how much he loves her. 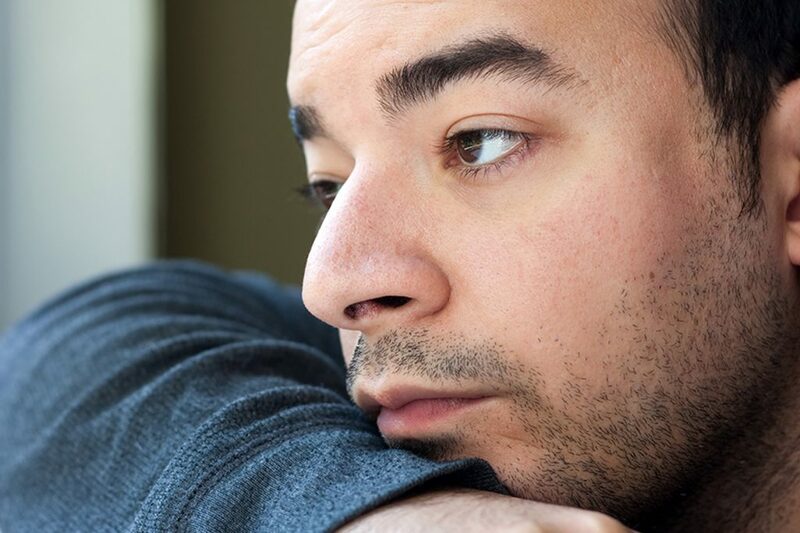 This delay is often interpreted as the husband not caring, which can cause serious relationship issues. Either the client with PFAAN or the counselor needs to explain to the wife that it is hard for the husband to rapidly communicate his feelings but that, given time, he will tell her exactly how he feels. You might also help clients with PFAAN “schedule” spontaneity into their relationships to improve them. I had a friend who decided that his wife liked being surprised with flowers, but he was not at all given to being spontaneous. So, he sat down, budgeted how many times he could afford to give his wife flowers (yes, he had a flower budget), and then randomly assigned different dates on his schedule for presenting the flowers. As a result, she got spontaneous (thus emotional) demonstrations of affection, and he still got to operate via a schedule and a budget. It worked great for them. In a work example, a colleague wants to know everyone’s gut feelings about a new project. It may be important to teach the client with PFAAN how to tell this colleague that it will take time to understand what he or she feels about the project. If forced to communicate too quickly, deep anxiety or shutdown may occur. Clients with PFAAN typically have difficulty with “gut” feelings. 6) Use superhero/comic/sci-fi character modeling. Most of my clients with PFAAN like superheroes, fantasy and science fiction. Anime, a kind of film animation that originated in Japan, also seems very popular with these clients. I have noticed that almost every time an anime character has an emotion, the emotion is accompanied by an exaggerated facial expression or sound cue. You almost always know how an anime character feels, which may explain why anime is so popular among individuals with PFAAN. Many researchers seem to suggest that Asian cultures include more PFAAN by nature (e.g., saving face, defaulting to authority) than many other cultures do, which may explain why anime has these features. I always ask my clients with PFAAN about their favorite superheroes or other favorite characters. This gives me insight into the clients and often provides a good picture that I can use to help them develop the emotional attributes exhibited by the characters they admire. I use this superhero therapy in a variety of ways, but one good technique that uses the Feeling Wheel is to make a color feelings diagram based on the client’s favorite superhero so that the client has some visual concept to reference. One warning: Make sure that clients choose characters who will move them toward healthy and effective goals. If a hero (or anti-hero) whom a client has chosen would be unhealthy to emulate emotionally or morally, don’t be afraid to speak up. I say this from personal experience. I had one client who really liked the character Deadpool, but under no account should this character be an emotional or moral model. The concepts I have illustrated connected to the Feeling Wheel have been a revelation in helping my clients understand the difference between PFAANs and NONs and how to approach skill building and therapeutic effectiveness. It is the only tool I know of that explains and demystifies emotional responses in PFAANs and NONs (the group that most counselors fall into). These concepts and approaches have made a huge impact on my ability to help clients with PFAAN and their loved ones. Adults with PFAAN will find their way into your practice. It is important to know how their emotions work and what may be effective and rewarding in therapy, both for them and for you. Kenneth J. Smith practices at Spirit of Peace Clinical Counseling in Ohio. He enjoys working with clients with PFAAN and clients with existential challenges, teaching and speaking. He holds a bachelor’s degree in animal science, a bachelor’s in history, a master’s degree focused on animal welfare/behavioral psychology and a master’s in clinical mental health counseling focused on the treatment of shame and guilt. Contact him at info@kentherapy.com or through his personal professional website at kentherapy.com. I found this article to be extremely helpful. I am in my forties and married to an autistic male. He is a wonderful man but not being able to understand social cues has been difficult for him (and me). I have worked hard to communicate with him and to learn how to adapt to his way of communicating and it has not been an easy struggle. I highly recommend “The Other Half of Asperger Syndrome (Autism Spectrum Disorder): A Guide to Living in an Intimate Relationship with a Partner who is on the Autism Spectrum” by Maxine Aston to anyone and everyone who is in a relationship with someone on the spectrum. This book is insightful as to how we neurotypicals misunderstand the autism language, and how they misunderstand us in intimate relationships. It is a short book with several gems of knowledge that help to understand each other without feeling so wiped out.